The following work was carried out by K. Agathos in the Aristotle University of Thessaloniki (AUTH) and in ETH Zurich as part of his PhD thesis under the supervision of Professor D. Talaslidis (AUTH) and Professor E. Chatzi (ETH) in collaboration to Professor S.P.A. Bordas and Professor G. Ventura. The vector level set method was developed by Professor G. Ventura and made available as part of the collaboration. 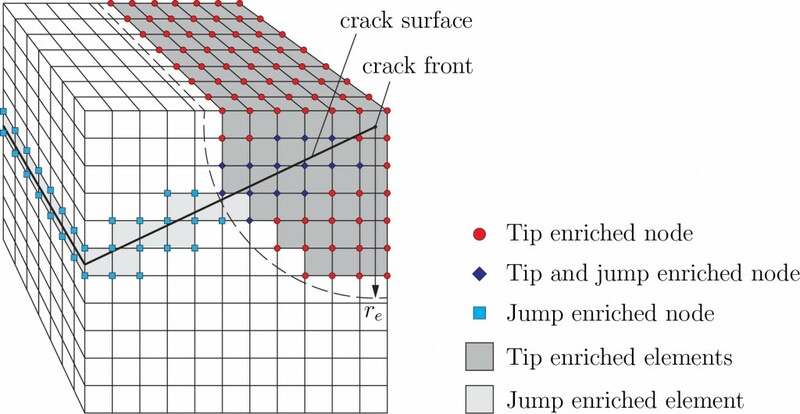 A variation of the extended finite element method (XFEM) for three dimensional (3D) fracture mechanics problems is developed which improves the performance of the method in terms of accuracy and computational cost by enabling the use of enriched elements in a fixed volume around the crack front (geometrical enrichment). XFEM using enriched elements in a fixed volume around the crack front. One of the problems associated with the use of geometrical enrichment in 3D problems is the substantial deterioration of the conditioning of the resulting system matrices which makes their solution very difficult and in some cases impossible. This problem is solved by the developed method by discretizing the crack front with some special univariate elements and by using their shape functions in order to weight tip enrichment functions. 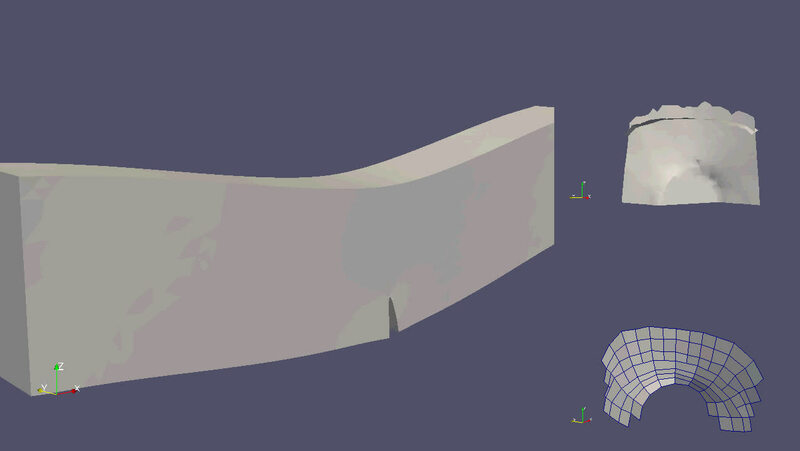 The use of those special shape functions inhibits spatial variation of the enrichment function weights in the plane normal to the crack front while still allowing spatial variation along the crack front which is essential in order to reproduce the behavior of the solution variables in general 3D problems. By employing this special tip enrichment technique it is possible to obtain optimal convergence rates for the general 3D case while keeping the conditioning of the resulting systems of equations almost unaffected. In order to further improve the accuracy of the method, special techniques are employed which minimize blending errors between the standard and enriched parts of the approximation. Additionally, element partitioning algorithms are used in order to carry out the numerical integration of the enriched part of the approximation. A novel benchmark problem is also developed which enables the computation of displacement and energy error norms as well as errors in the stress intensity factors for the general 3D case. Through this benchmark problem the accuracy and computational cost of the proposed method are tested and compared to standard XFEM. Finally, the method is combined with a three dimensional version of the vector level set method in order to handle crack propagation problems. The vector level set method makes possible the construction of level set functions for evolving cracks by employing only geometrical operations and thus avoiding the integration of differential evolution equations. The combination of the two methods is used to solve several crack propagation problems. The obtained results are similar to the ones found in the literature.